Europe's migrant crisis rarely hits the headlines now - but it is far from over. Italy has announced a new record of 171,000 migrants crossing the Mediterranean this year. Its asylum system is under strain, with more than 176,000 people in reception centres. But why is Italy seeing more and more migrants, when the crisis of migrants crossing from Turkey into the EU appears to have abated. Wasn't the migrant crisis over? The migrant crisis was never over, but because the numbers crossing into Greece has fallen, the media spotlight on the Mediterranean has largely moved on. Tighter controls, fences, and an EU deal with Turkey have helped stem the flow of migrants through the Balkans into Central and Western Europe. The UN refugee agency says that 347,709 people have arrived in the region by sea this year - a significant fall from the million who crossed in 2015.. But the influx into Italy is actually slightly higher this year. In fact in October and November the numbers have been two or three times what they were in the same months last year. That is not long enough to establish a trend, but there are two possible explanations. Better sea conditions late in the year may help explain the recent jump in numbers, says Barbara Molinario from the UNHCR: "But what we're noticing is there are more and more people on a single vessel ... making it more dangerous." Increased numbers on a single craft - often barely seaworthy - is resulting in more deaths, she explains. So far this year, 4,690 people have died at sea in the region, compared with 3,771 last year. Has the influx from Turkey really stopped? While numbers into Italy have risen, migrant routes via Greece and the Balkans were largely closed down by an agreement between the EU and Turkey in March. Under the terms of the deal, the EU could deport migrants who failed to claim asylum from Greece back to Turkey. In return the EU would allow equal numbers of Syrian refugees from Turkey and hold talks on visa-free travel for Turks. Arrivals to the EU through Greece dropped significantly after the deal was struck. But the numbers are beginning to rise again and Turkish President Recep Tayyip Erdogan has threatened to let more migrants through if talks on EU membership are frozen. The chances of that increased when the European Parliament voted to halt talks last week. Has the Italy influx risen because the Greece route is blocked? No, although it may look like it. In Greece, 47% of the migrants and refugees have come from war-torn Syria. But for Italy, the nationalities involved are almost all African. 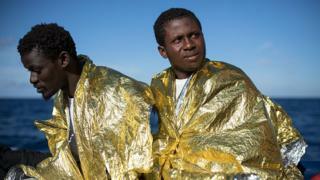 Italy's interior ministry said 36,000 came from Nigeria, 20,000 from Eritrea and 12,000 from Guinea. A recent report from the UNHCR indicated that 88% of migrants arriving in Italy started their Mediterranean journey in Libya, on Africa's north coast. So while Greece is dealing with a predominantly Syrian and Afghan influx, Italy's crisis is very distinct. Nigeria is beset by the insurgent group Boko Haram, which has killed thousands and disrupted the lives of millions in Nigeria and neighbouring countries. One UN agency warned that years of violence has "emptied villages" and left millions of people starving. In Eritrea, many flee every month from what the UN last year called "gross human rights violations". From the age of 17, compulsory military service applies. Some conscripted soldiers serve for decades, and a UN report likened their conditions to slavery. Eritrea rejected the findings. These, however, are just two examples. African nations each have their own issues, and the migrant crisis has many causes. Can Europe block off the Libya route? Libya is politically unstable, with rival parliaments, backed by opposing military and militia forces, controlling large swathes of the country. A UN-brokered government has only limited power, as armed militias stick to one side or another - all while battling the last remnants of the Islamic State in the country. The instability has made it a hub for people trafficking from Africa, and migrants who arrive from Libya tell of violence and trauma. All this has left the EU without the option to strike a deal, similar to the Turkey arrangement, which might stem the flow. What's happening to migrants once they get to Italy? The vast majority end up at one of Italy's "reception centres" to begin with. Applications for asylum in Italy have been steadily rising month by month, according to the EU's statistical agency. Over 85,000 applied as refugees between January and September - more than any other EU country except Germany. But only a tiny fraction of those are likely to obtain formal refugee status - Italy granted just 20 people such status in 2015. Barbara Molinario from the UNHCR said that in 2015 most migrants planned to move on to other European nations - but many were now staying and enrolling for the EU-wide relocation programme. But that is taking time, and causing logistical problems. "The system is definitely under pressure, because the relocation scheme is not working the way it should," she said. "There have been about 40,000 places pledged, but only about 4,000 people have been relocated... they're not moving out of the system fast enough."